Bribe your players with bonus tokens. I’m going to start something new in my campaign in order to speed up gameplay. I run 7 players right now, and sometimes the game grinds to a halt due to slow decision making during combat. I understand that the tactical nature of 4th Ed. somewhat created this situation, as opposed to other, more abstract forms of the game, but it’s something I have to deal with. So, with that in mind, I know that people are greedy and I’m going to use that to my advantage. 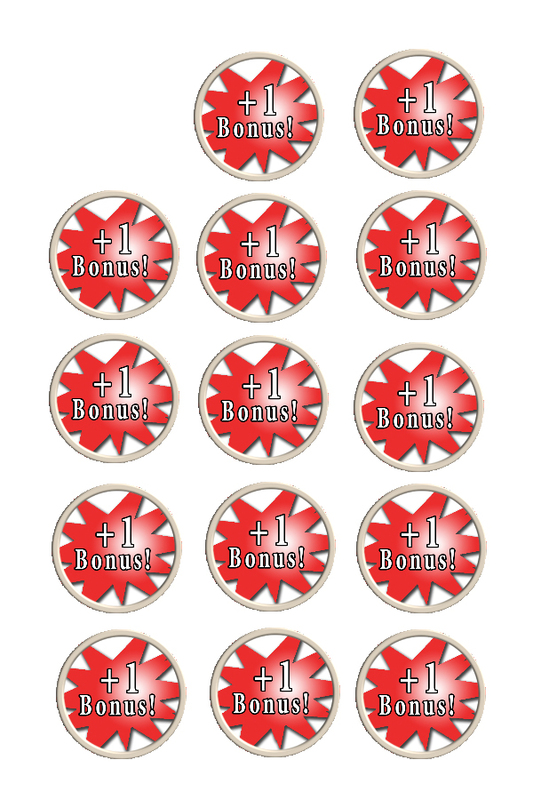 I’m going to offer my players a +1 or +2 bonus token, usable whenever they want, if they do something in the game that warrants the reward. 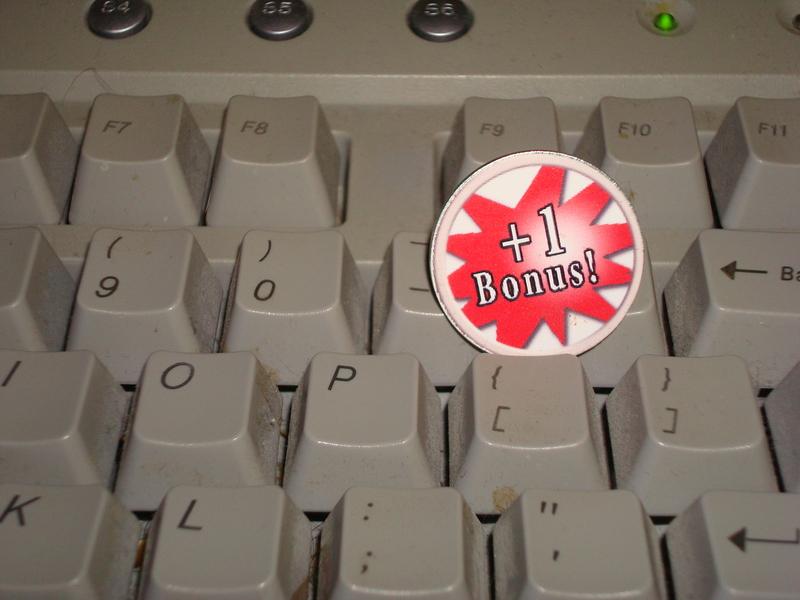 A token with a +1 bonus may encourage players to play faster. It can be faster decision making during battles or clever roleplaying. Whatever. Quicker action during combat? You may get a +1 or +2 bonus! I think it’ll encourage people to play faster, as a bonus usable anywhere at anytime can really make a difference. The +2 I plan to hold it until someone does something that really calls for it. It’s not going to be handed out too often. As far as the mechanics go, it’ll be like an interrupt, added to any roll in the game they want. Rolled a 9 on an important saving throw? “Wait! I’ve got my bonus token!” They will not stack though, or carry over from session to session. Download the +1 tokens and use them in your campaign! These tokens were made using my tutorial. Lets see how it goes. What do you all think? Plot hook of the day: A river next to an elvish settlement has dried up, with no explanation. Elora, a female elf druid had started to investigate, but she has since dissapeared. A teleportation circle has mysteriously appeared close to the river, but nobody dares step unto it. The elves need your help! Where did Elora go, and what happened to the river? 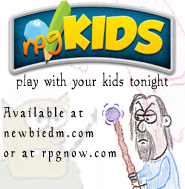 ← New DM Starter Kit now available! I think it’s a great idea, personally. neat idea in theory, but ive always found players hate having more stuff to keep track of. with 7 people i would just award an action point every encounter. Dude that’s almost written verbatim. Either great minds think alike, or I am a thief. I promise I am not a plagiarist. Its cool. I didn’t seriously think you had. I know I got the idea from someplace else and just can’t remember where. Thats the way blogs and social media work sometimes, ideas are planted and you don’t remember exactly where it came from. @Mike, thanks for noticing the plot hook btw… was wondering if anyone was reading them! Do you let your players share their tokens with other players? To use your example of the saving throw, if I have a +1 token and the defender is bleeding on the floor next to me making death saves and rolls a 19, can I give him my +1 token to use thereby giving him a 20? It would be my choice, but if I’m willing to make the sacrifice would you allow it? No. Because the tokens are meant to reward individual play, usable only in individual situations. You can’t give them away t a player who hasn’t earned them. So no, the defender in your case is screwed. I tried this in my game tonight but hadn’t read the comments first. When a situation came up where my players wanted to help each-other out, I went ahead and allowed it. As it turned out, they sort of passed them around. No one player ended up with preferential treatment and once they figured out what I was awarding them for (clever roleplaying, fast actions in combat, and especially cool, cinematic moments) they all managed to get a few throughout the four-hour session. The way I saw it, it promoted some selfless thinking in players who tend to be… well… narcissistic. I actually found that to be one of the best developments of the night! I made some tokens for my group today and plan to use them to reward good role playing, creative thinking, and other non-mechanics type heroics. The more crazy and fun the action or idea, the greater chance that I’ll hand a token out. Since I want the tokens to encourage further creative thinking and action, they don’t give a specific mechanical bonus. Instead the player can trade the token in the next time they want to do something that is in the grey areas of the rules or is just plain cool. Essentially I’ll treat a token as a free pass to tweak the rules a bit or even ignore them outright if that gives the most exciting outcome. I’m a “just say yes” style DM when it comes to this stuff anyway, but with a token the player should be able to do really outrageous stuff that would normally require difficult rolls or exceed my ability to bend the rules and still come across as fair. I’ve created an image file with the tokens I’m using in case anyone else would like to use them. I seem to have messed up the link the first time. Here’s another attempt at posting a link to my Woah Tokens.